If you thought roller chain was your only drive option, think again. 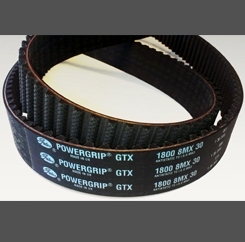 Gates new Poly Chain® GT® Carbon™ belt is part of a powerful synchronous belt drive system that outperforms roller chain in even the most demanding high-torque applications. 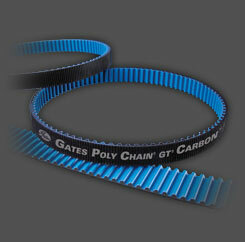 Gates Poly Chain® GT®2 belts have been replaced with Poly Chain GT Carbon belts. In most drives they serve as a direct replacement. If you have questions, please click on the Product Application link below. 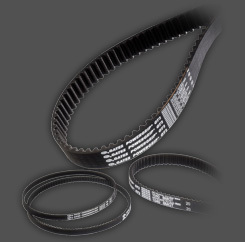 If you thought roller chain was your only drive option, think again. 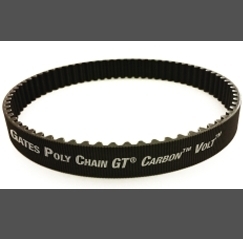 Gates new Poly Chain® GT® Carbon™ belt is part of a powerful synchronous belt drive system that outperforms roller chain in even the most demanding high-torque applications.Gates Poly Chain® GT®2 belts have been replaced with Poly Chain GT Carbon belts. In most drives they serve as a direct replacement. If you have questions, please click on the Product Application link below.